The National Trust can now offer a range of Outdoor Courses in the Shropshire Hills, as well as accommodating Duke of Edinburgh Award groups. 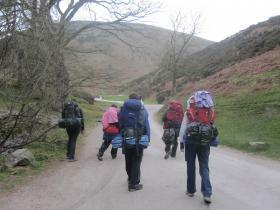 There are a number of campsites on the Long Mynd for youth groups. Please contact us for details. Please use the booking form below to book a service, or let us know of your group's visit. There is no charge for DofE groups apart from a £3.00 per head camping fee for those using the "wild campsite" at Pole Cottage. It is important that we are aware of all groups using the area via the booking form below.